All Replies on Help with lathe live center, chuck, etc. Help with lathe live center, chuck, etc. That is a spur center on the spindle… and I believe (but not 100% sure) that it’s threaded on. Hard to tell from the picture. Does the hole in the pulley go all the way through? If so, it may be a taper fit and needs to be banged out with a knockout rod. IIRC, those machines were sold under several different names. I’d hunt for a manual – maybe an older HF lathe is the same? Thanks, ,Brad. I meant to write spur center. That hole in the pulley looked so small I thought it couldn’t operate that way. Guess I’ll try both ways. Thanks,Jerry. I’ll give it a try. Those lathes came with wrenches to remove the drive center, put one on spindle and other on drive center. Unless I am wrong cannot remove the live center in the tailstock. That style lathe did come with diferent size spindles and threads, so just measure to see what you actually have. Just from looking at your picture spindle looks like is 1” x 8 TPI which makes buying a chuck or additional faceplates little easier. The spindle is solid on those lathes so don’t worry about Morse tapers. Thanks everyone. Yes, 3/4” on flats, 7/8” on spur and it’s off. Does look like a 1” x 8 tpi. so, the cheap way to expand any use of my lathe would be a faceplate, right? The more expensive being a 4 jaw chuck? Yes, 3/4” on flats, 7/8” on spur and it s off. Does look like a 1” x 8 tpi. I’m confused (not something new). 3/4” on the flats on the spindle and 7/8” on the spur? If the exterior of the spur is 7/8” then the spindle can’t be 1”. One which I started with had a 3/4” X 16 tpi spindle. Faceplate or chuck is up to you but a chuck is more versatile. Faceplate probably about $20 or chuck about $100. As you should be. 3/4”. so, the cheap way to expand any use of my lathe would be a faceplate, right? 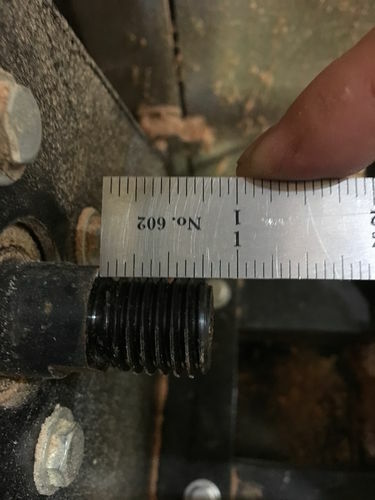 If remember right can find either 1” x 8 TPI or 3/4” x 16 TPI on that lathe if you are measuring the drive center at 7/8” of an inch have my doubts about spindle being 1” x 8 TPI. They were sold by many different companies. Very iImportant for you to count the number of threads per inch using a sharp pencil and ruler to make sure what the thread count actually is before buing faceplates or chucks. If having trouble figuring it out take lathe to a local Machine shop and ask if they can use their threads per inch gauge. You can also buy a gauge bu might only have a one time use. If get it wrong will end up buying a spindle adapter to get accessories to fit. I’ll go back and count the threads again, but it sure looks to me like a 3/4×8 (I’m sure of the 3/4”—measured with caliper). That’s not a very popular size. According to several owners accounts I’ve been able to find, that lathe is similar or the same as the older Harbor Freight 14×40 lathe (although some also had an outboard sanding disc). Buffalo Tool company was just an importer, and the Buffalo brand was a trademark of the TAB Merchandise Corp (now defunct), so it’s very possible they were identical with just different colors. Those had a 3/4” X 10tpi spindle. Thanks, Brad. You’re probably right about the threading. I knew it wasn’t 16, but I haven’t gone back out to the shop to confirm. I don’t necessarily need a faceplate or chuck, I was just thinking through what I might need someday. I’m not going to be a big bowl or vase guy, but I should probably turn at least one bowl just to say I did it! If it is 3/4×10, that will make my decision making a bit easier since there aren’t lots of faceplates and chucks made with that threading! Here you go. 3/4” diameter, about 3/4” in length. Looks to me like 5 threads in the 1/2” section. He list a 3/4X10 faceplate for $8 but could probably make a 3” as well. It is not relieved but it appears that your spindle does not need a relief. If you decide to go with a chuck, and if that chuck is a Nova, you will need insert “H”. BTW, I was wrong. The spur was 15/16”, not 7/8” not sure how I made that mistake.